Iron is an important nutrient for a healthy body. Iron helps to carry oxygen to our brain. If you lack iron, you may be more likely to develop fatigue or anaemia or neurological problems. Incorporate iron rich foods in your daily diet. Choose high iron foods from the list of iron content of vegetables, fruits, legumes, lentils, nuts, seeds, spices and herbs. Most of the foods high in iron for vegetarians can be grown in your garden. The daily iron requirement depends on age and gender. If you are a woman, your recommended daily amount of iron is 8 mg. A woman needs 18 mg of iron daily, whereas a pregnant woman may need up to 27 mg. You should aim to take the required amount of iron in your diet. Keep in mind that iron is not easily absorbed by the body even ir you eat high iron foods. The amount of iron absorbed from vegetarian food is up to 10%, while it is 10 - 20% from animal food. Foods that are rich in vitamin C help to increase iron absorption. Also iron from raw foods is absorbed better. Vegetarians need to be especially careful, because plant-based sources of iron are not as easily absorbed as iron from animal-based foods. Fruits such as cantaloupe, grapefruit, strawberries, orange, etc. help iron absorption. 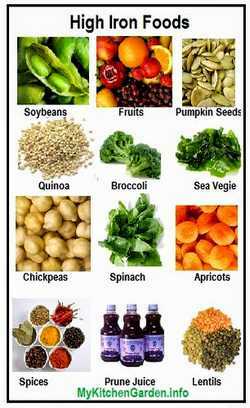 Following are the best iron containing vegetables, fruits, nuts, seeds and spices. Pulses & Beans: Chickpeas, black-eye beans, lentils, soybean. Vegetables: Beetroot greens, mint, parsley, turnip greens, broccoli, bok choy, collard greens and Brussels sprouts, Sea vegetables are high iron foods. Herbs and Spices: Almost all herbs and spices are high in iron. All the spices and herbs are high in iron content, so the herbs are ood for increasing iron, but you must know that you cannot consume too much of these in your diet, not more than 10-20 g. You may drink iron rich herbal tea made of these herbs. From the list of iron in spices and herbs, all the dried herbs are high in iron, you will notice that dried thyme herb is one of the most iron-rich herbs. Many vegetables, fruits, legumes and lentils are iron rich. Chickpeas and soybeans are also good sources of iron. One cup of sunflower seeds gives about half the body's daily iron needs along with plenty of vitamin E.
You can grow your own iron rich foods in your garden. Some of the high iron foods like spinach (growing spinach), potatoes (growing potatoes), peas (growing peas), pumpkins, Broccoli, tomatoes (growing tomatoes), mint (growing mint), turmeric (growing turmeric) etc can even be grown in pots and can be placed in your balconies or terrace.